If you have a pool, it is critical that you have the proper pool balancing chemicals to keep the water safe, clean and sanitary. Pools need the correct combination of calcium, alkalinity, pH, stabilizer, chlorine, shock, and algaecide, to keep the water sparkling clean. In case of issues like cloudy or green water, pool owners might also have to use different combinations of pool products to correct the problem. Understanding how to use pool balancing chemicals can be an overwhelming prospect for many new pool owners; it can even dampen the enthusiasm that a homeowner has about purchasing a pool for their backyard. But is more than just a pretty pool. Water balancing is the most important aspect to protecting filter equipment, pool surfaces, and swimmers. This is where Daigle Servicing Company can help. All of our employees are trained in pool clarity troubleshooting. After installation of either an above-ground or in-ground pool, our clients receive “Pool School” training on how to properly care for their new pool. To shorten this learning curve, Daigle Servicing Company always provides a free water balance test at our pool supply store in Hudson, New Hampshire. All of our retail customers can be assured of buying only the chemicals they need to maintain the clarity of their pool. Smaller quantities. Better products. When it comes to chlorine tablets, you definitely get what you pay for—and in this case, we feel the ProTeam Pure Tab chlorine tablets are the best that money can buy. Unlike poorly-made chlorine tablets that dissolve in just two to three days, Pure Tabs will last for five to seven days. These high quality tablets are made (without fillers) on a 150,000 pound press, which results in chlorine tablets that are solid all the way through. Most tablets on the market are 1 tablet per 5,000 gallons of water. Our ProTeam Pure Tab is 1 tablet per 10,000 gallons of water. What does this mean to the customer? Twice as much chlorine in every bucket – resulting in a significant chlorine savings each season. Relax! Pool maintenance will eventually become easy for you. Once you have balanced your pool and established a maintenance regimen, keeping the pool water clear will become second nature to you. 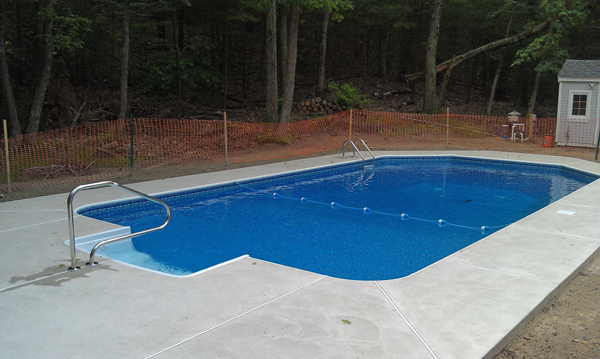 Plus, you always have the experts at Daigle Servicing to help you through any pool issues that may arise! Although your own pool maintenance regimen may vary slightly, our once-a-week application system will take the guess work out of maintaining your pool. This weekly package includes Power Magic shock and Microfloc Clarifier which doubles as an algaecide. Combined with your chlorine tabs and regular pH testing, these products will help to maintain keep your pool crystal clear all summer long. To take the mystery out of pool clarity, please give our company a call, or come visit our store. We will be happy to discuss your pool chemical maintenance needs and provide you with your own customized maintenance plan.